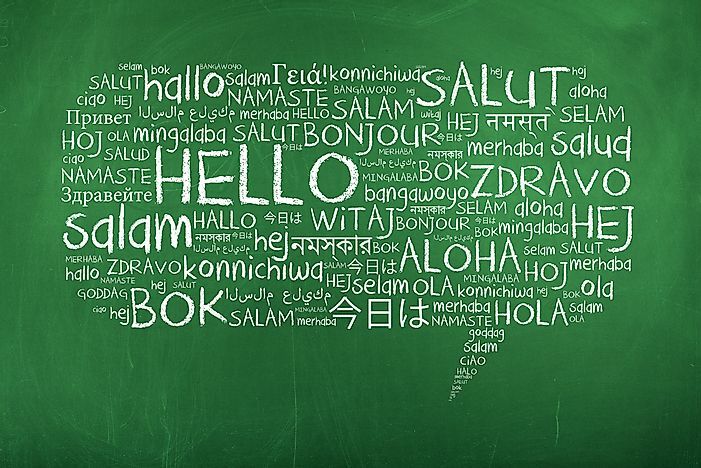 The world is home to a wealth of languages spoken. This is a sample of some of the languages with the least distribution. A chalkboard featuring some of the world's most widely used languages. Did you know there are also languages with very few speakers? There are diverse and vibrant languages used in different parts of the world. Languages have varying numbers of speakers where some are spoken by millions of people while others have only hundreds of speakers. Research has shown that languages are threatened by social development, colonization, and economic growth among other factors. Some of the languages with the least distribution will be outlined below. The Chamicuro language has only 20 speakers in the modern day. It is classified in the Arawakan language family which includes languages such as Arawak and Guajiro. The language belongs to the Chamicuro people who inhabit a tributary of the Huallaga River in a region of Pampa Hermosa in Peru. The language is recognized as an indigenous American language, and it is critically endangered. The children living in Pampa Hermosa do not speak the language but rather speak Spanish although a Chamicuro dictionary has been written. The language is unfortunately nearly extinct. The Sarcee language is also referred to as Tsuut’ina and it is classified as an Athabaskan language. It has 170 speakers who belong to the Tsuu T'ina Nation with a territory near Calgary, Alberta. The Tsuu T'ina people settled in the Great Plains in the 1700s after breaking away from the Danezaa people. The population of the Tsuu T'ina people is estimated at 1,982, and they live in reserve occupying an area of 109.32 square miles. The Sarcee language is mostly spoken by the elders, but the younger generation has embraced efforts to learn the language. The Paipai language is part of the larger Yuman language family. It is spoken by the Paipai people who are indigenous to northern Baja California, Mexico. The Paipai community is related to the Yavapai, Kiliwa, and Kumeyaay ethnicities. There are approximately 200 Papai speakers since most of them have settled in Kumeyaay villages. Judith Joël has published texts in Paipai language. Mauricio J. Mixco has also written transcriptions of stories. Linguistically, the Paipai language is related to the Upland Yuman language whose dialects are spoken by the Walapai, Yavapai, and Havasupai ethnicities in western Arizona. The Satawalese language has 460 speakers, most of who live in Satawal Island in the Federated States of Micronesia. A small population of speakers inhabits Yap State, adjacent islands, and atolls including Pulusuk, Lamotrek and Chuuk State as well as Saipan, some areas of the US, and the Commonwealth of the Northern Mariana Islands. The number of Satawalese speakers has been growing according to research such as the one carried out in 2007 by Kevin Roddy who reported 700 speakers. The Satawalese language belongs to the Austronesian language family in the Truukic branch. It is closely related to the Mortlockese, Tanapag, Carolinian, Tobian, Mapia, and Woleaian languages. Although the language is regarded as endangered, a lot of effort is being implemented towards its sustainability. According to UNESCO estimates, more than 1000 languages are severely or critically endangered. Among the factors that contribute to the extinction of languages are a small geographical range and a fast decline in a language’s number of speakers. Communities, linguistics, and governments are all critical parties to revitalization efforts for endangered languages. The Irish language is an example of a language which has been successfully revived. Having experienced a decline as a spoken language, Irish benefited from the widespread interest in the 19th century, a period known as the Gaelic revival.